Create a space – a corner, a table, a room, a home – that inspires you. Focus on process not product. Establishing a creative environment is important, however, you also need a creative attitude. To often we want to make a ‘thing’, we want a basket – so we focus on the end result. But creativity is a process, it doesn’t always have a finished product. And it is normal to have an idea that takes many tries to develop into a finished project. I am always amazed at how many new ideas each of those ‘tries’ adds to my sketch book. I am also amazed at how often an idea doesn’t develop as I thought it would. 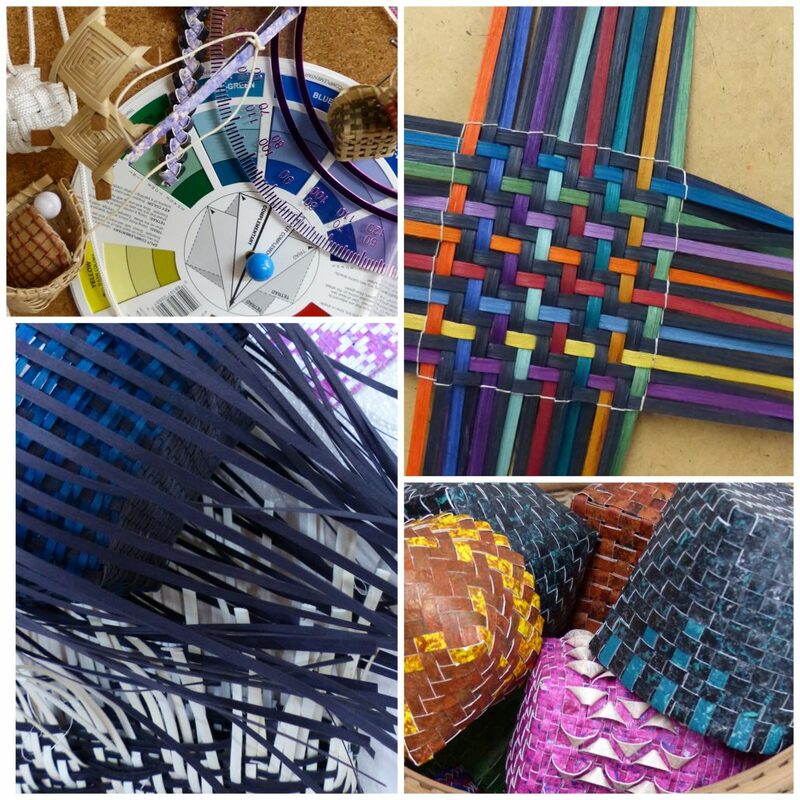 Immerse yourself in the process of weaving. Weave ideas, even if you are unsure of what the end result might look like. I love to make basket bases and leave them on my weaving table or clipped to my easel. 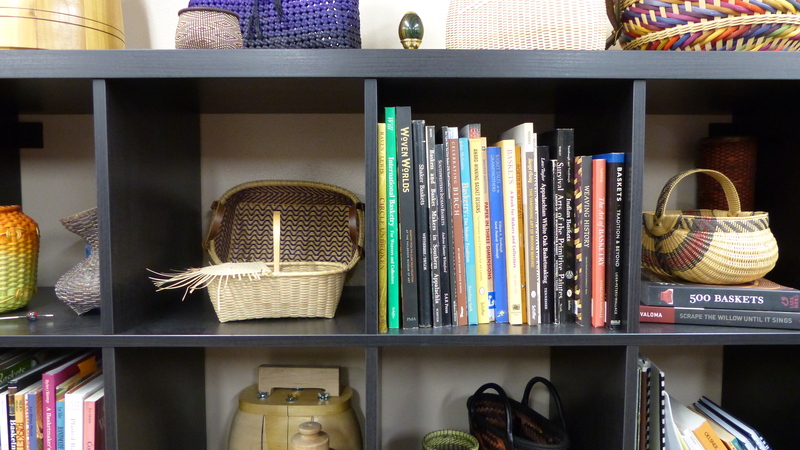 Two bases woven exactly the same have inspired completely different baskets. And, I almost always have baskets in process, sometimes these baskets get completed as ideas come to me – some times not much comes of the idea. It’s okay to play with partial ideas. Create a board or wall of ideas. Tack up things that encourage you. Things you want to do again. Sometimes an idea I am working on isn’t ‘working’, but part of it is perfect. I have cut the good part out and tacked it on the board to remind me of the success. My board is a collection of parts and pieces of my work. Keep a notebook and/or sketch book. Use it to keep track of tips and things you are learning. Use it for new ideas, use it to document your creative story. After all these years, I have several notebooks and sketchbooks and folders of notes. It really is interesting to look back at my basket journey via these scratchings. 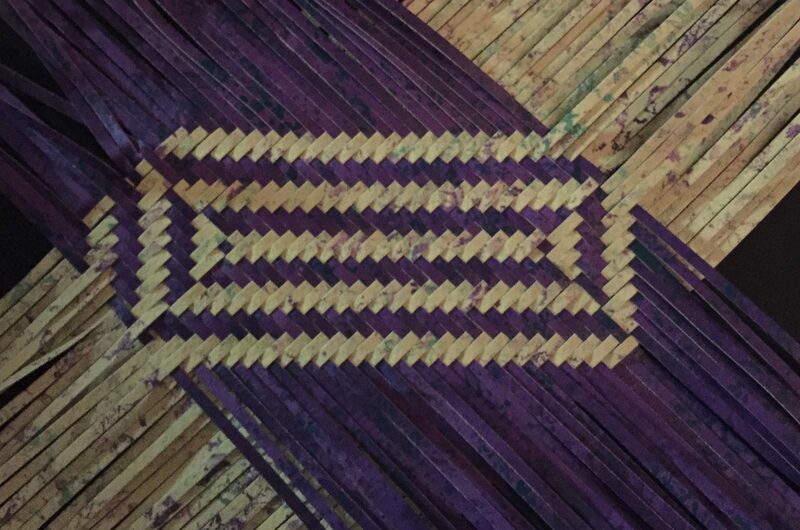 Make some weaving goals. Every year I focus on a technique or material I want to understand better and work towards mastering. One year it was cathead baskets, another year it was braid weaving and yet another it was round reed. During the year, I read everything I can on the topic and I study baskets that use that technique or material. And I weave using that technique as often as possible, sometimes I will become so obsessed with the technique that I just can’t stop working with it. And the more I practice a technique, the more thoroughly I understand what I am doing and while my skills improve, my sketch book fills up with new ideas. I have been doing this for 15 years and I believe it has been one of the most important things I have done to encourage creativity. Take Classes. 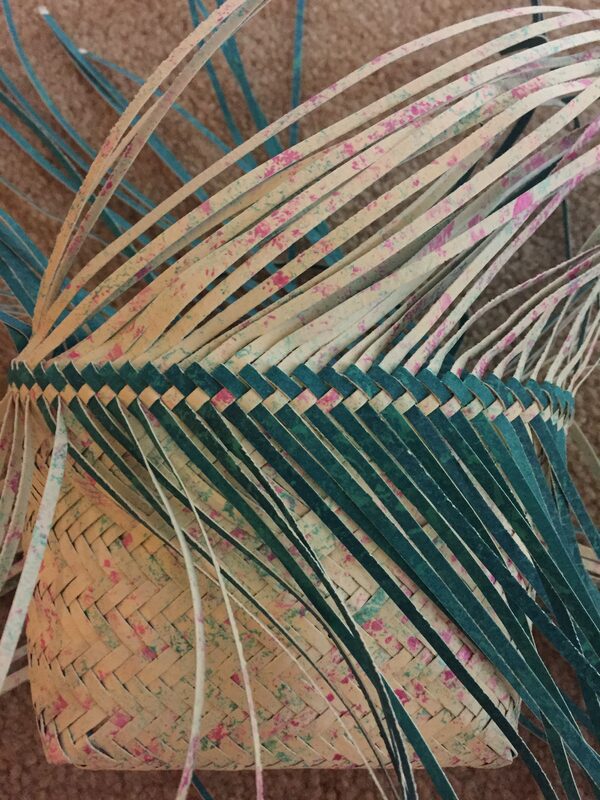 Sign up for basket classes to learn a new technique, to weave with a new material and to help you master basic weaving skills. You will find it beneficial to take any art class. I try to take at least one class a year, usually a basket class with a teacher I admire or to work with a material that is new to me. I have a list of people I want to learn from. The most important thing you can do is weave. Weave something for a friend. Weave for yourself. Weave that pattern or kit you bought last year. Weave something to sell. Weave up that idea you have. Weave something to exhibit. Weave something easy. Weave something challenging. 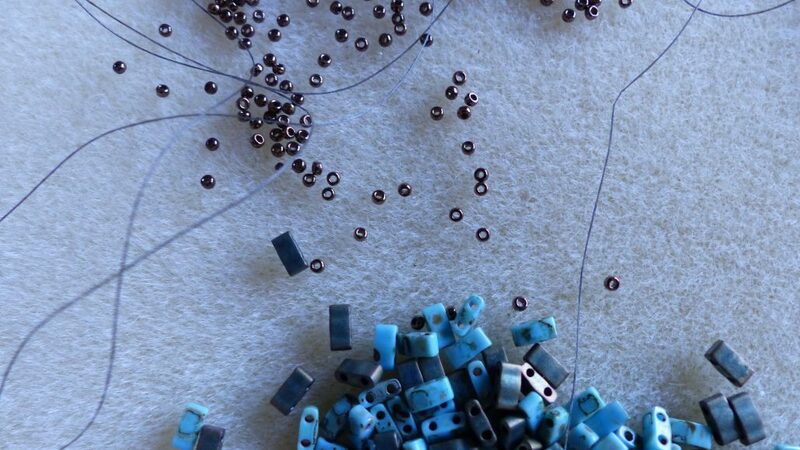 And when you feel there is nothing new … when not a single creative thought is left, set a coil of dyed reed or a beautiful handcarved handle on a table, within sight, and go do something else. Make delicious food, knit a colorful scarf, make a quilt, bead a bracelet or take a walk in the woods. Focus on something else for a while. For me it works every time – before I know it a color or a shape or a delicious muffin will have me thinking about weaving again. Yes, these are the things I do regularly. It’s kind of a long list, but it is not an arduous task list. Really! Rather each of these practices continue to help me hone my skills and spark new ideas. 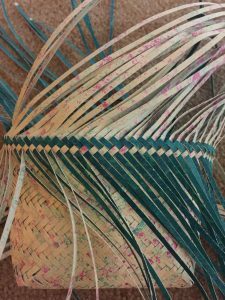 These practices keep basket weaving fresh and challenging and flood my mind with new ideas. They make my hands ache to weave. Hopefully these activities will inspire you! If you missed my last post, Creativity and Excellence, you can find it here. This is just what I needed to read. After suffering from a weavers block, I took your advice and just picked up some spokes and started up again. Thanks.